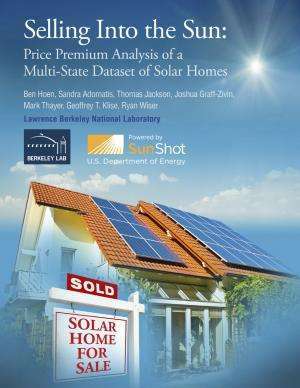 A multi-institutional research team of scientists led by the U.S. Department of Energy's Lawrence Berkley Laboratory (Berkeley Lab), in partnership with Sandia National Laboratories, universities, and appraisers found that home buyers consistently have been willing to pay more for homes with host-owned solar photovoltaic (PV) energy systems —averaging about $4 per watt of PV installed—across various states, housing and PV markets, and home types. This equates to a premium of about $15,000 for a typical PV system. The team analyzed almost 22,000 sales of homes, almost 4,000 of which contained PV systems in eight states from 1999 to 2013—producing the most authoritative estimates to date of price premiums for U.S. homes with PV systems. "Previous studies on PV home premiums have been limited in size and scope," says Ben Hoen, the lead author of the new report. "We more than doubled the number of PV home sales analyzed, examined a number of states outside of California, and captured the market during the recent housing boom, bust, and recovery." More than half a million U.S. homes had PV as of 2014, and the number is growing rapidly. The growth in home PV systems means that the real estate industry will need reliable methods to value these homes appropriately. Further, having greater certainty in those methods will likely facilitate additional growth in the residential PV market. Hoen is a researcher in the Environmental Energy Technologies Division of Berkeley Lab, who collaborated with researchers from Adomatis Appraisal Services, Real Property Analytics/Texas A&M University, University of California at San Diego, San Diego State University, and Sandia National Laboratories. The study also found only a small and non-statistically significant difference between PV premiums for new and existing homes. Additional findings include the existence of a PV "green cache" (home buyers paying a certain amount for a PV system of any size and incrementally more as system size increases) and an apparent sharp depreciation rate for the PV premium in home sales transactions as those PV systems age. The study also finds that market premiums are statistically similar to those estimated using the income and cost approaches, methods familiar to appraisers. This similarity to standard appraisal practices further bolsters the report's usefulness to real estate professionals and markets. "As PV systems become more and more common on U.S. homes, it will be increasingly important to value them accurately, using a variety of methods," says co-author Sandra Adomatis, an appraiser who helped develop the Appraisal Institute's Green Addendum and who has written and spoken extensively on valuing green features. She noted, "Our findings should provide greater confidence that PV adds a quantifiable premium to a wide variety of homes in California and beyond." The research was supported by funding from the U.S. Department of Energy SunShot Initiative. The SunShot Initiative is a collaborative national effort that aggressively drives innovation to make solar energy fully cost-competitive with traditional energy sources before the end of the decade. Through SunShot, DOE supports efforts by private companies, universities, and national laboratories to drive down the cost of solar electricity to $0.06 per kilowatt-hour. There's a solar system contracted for in the UAE where the winning bid promises to deliver solar electricity at 5.98 cents per kilowatt hour. So with a bone dry, low latitude desert site, solar can already hit that price target of 6 cents. Yes but how does this compare to homes with LEASED solar panels ( like Solar City)? My neighbor sells power in excess of his use back at over 5 cents/kWh. He also pays a smaller amount than I do for usage.